Thanksgiving break seemed like it would go on forever but Sunday is finally here. We had morning plans, so I went out for an early run. 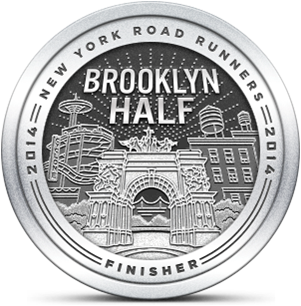 Although I didn't intend to run with a lot of intensity, I kept my max HR between 81%-91%. This produced a nice speed improvement over yesterday. I'm still outside my target zone for performance, but I've brought my pace down almost a minute over my last four runs. There were two factors that held me back today: a miscalculation in terms of dress (too many layers for 50°) and an 11 MPH wind that hit head on during a couple of long stretches. In neither case was I particularly uncomfortable, but I did wish for shorter sleeves and a gentler breeze. The smell of burning leaves enveloped the neighborhood and inspired me to push a little harder. In fact one of my splits was my fastest mile this year, not counting track intervals. I'm sure the Garmin was confused to see me running in the eight minute range. The real news of the day happened after my run, when we did some end of break shopping at the Gallery at Westbury Plaza. After some awesome Thai coconut curry at Noodles & Co., I stumbled upon one of the biggest running related bargains I've ever seen. My daughter was looking for some new running shoes so we stopped into Famous Footwear to see what they had. I usually view Famous Footwear as an outlet for low end models and slow selling remainders, but they do occasionally surprise me. As I scanned the shelves in the men's section, I noticed a pair of ASICS Kayano 20's with a sign that said $64 | regular price $159.99. I knew that ASICS had introduced the 21s, so I would have expected to see these discounted (at best) to the $110-120 range. $64 seemed way too good to be true. Note the $95 "price conflict"
I found a pair in my size to try on. I figured that if they fit as well as Kayanos usually do, I could ask the actual price and see if it was still competitive. I was slightly ambivalent when I put them on, but after a few quick steps at the back of the store, I wanted them. I asked the assistant manager for the actual price and she said, "$159.99." 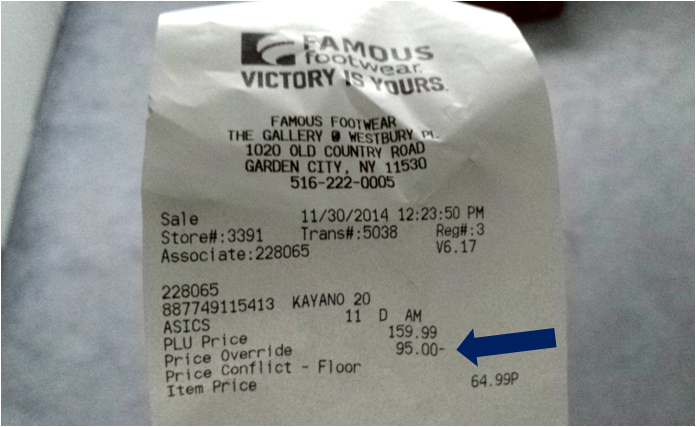 I showed her the shelf tag and she said I could have the Kayanos at that price - that it was their error. She was really nice and even let me use their deal of the day (buy one pair and get another at half price) to buy my daughter her shoes. Needless to say, I'm very excited about this purchase. After five years wearing lighter, more minimal running shoes, I've been thinking lately about the industry's pendulum shift toward more substantial and cushioned models. I'd considered the Hoka Cliftons as well as the Brooks Transcend and the new Adrenalin 15s, among others. The Kayano is THE classic stability trainer and I'm curious to see how I'll do in a shoe that weighs 25% more than my Saucony Virratas. I suspect I won't miss the lightness at all. Just when you think you got a good deal, someone else has to post about their better deal... Just kidding (about just kidding). You did get a sweet bargain! My Asics feel like I'm running on clouds, too. Enjoy! I thought about your recent shopping spree. I guess it's the season for running bargains. The Kayanos do feel cushy and very different from my Sauconys. 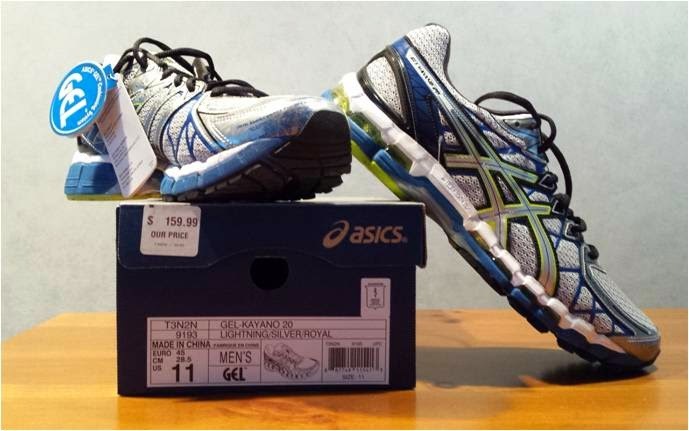 The ASICS also have a slight rise in the forefoot that may provide some good response and energy return.